Set on multiple, flexible platforms (designed Conor Murphy), the production put John Eliot Gardiner and his orchestra (some 50 players) in the centre of the stage with the pit covered over to provide a fore-stage. 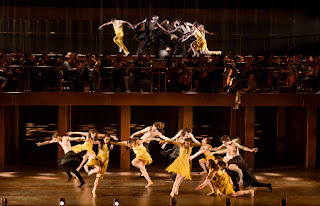 Sometimes raised above the action, sometimes below it, acting as a barrier between Orphée and the drama, the orchestra was as essential to the visual drama as they were to the sound world of the performance. Designer Conor Murphy used the platform (and a moving ceiling which had an added acoustical benefit). to created some notably evocative spaces, especially the scene of infinitely retreating space for the opening of Act Three. It has to be said that Juan Diego Florez sang with nothing like a haut-contre technique. What he did was, like many great singers before him, make the role work with his own technique whilst making stylistic modifications. It probably helped that, by using John Eliot Gardiner and the English Baroque Soloists, lighter and more transparent than a modern orchestra (though the performances were in fact given at modern pitch). So he needed to push less. Italian bel canto tenor technique is very much about the voice, the colour, singing with vibrant tone and producing intensity by opening the voice up. 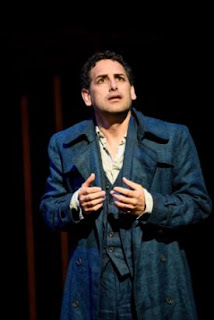 Juan Diego Florez explored how these techniques, modulated by some period sense and style, could explore the role. I thought perhaps he seemed a little constrained by the role, singing expressively and fluidly but with a lack of variety of tone colour. Though the opening cries of Eurydice were very poignant (I'm not sure he quite sounded as though someone was cutting his bone as Gluck asked the original tenor). But from the opening of Act Two, where Juan Diego Florez found a profound beauty of tone and shape to express the music, it was clear that there was going to be an interesting engagement between artist and role. 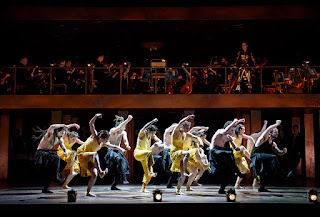 The famous elegy was finely sung indeed, with much variety of timbre between the strophes, but the opening to Act 3 with the long scene with Eurydice really brought out the musical drama. Lucy Crowe was very stylish and plangently poignant. Her Eurydice, particularly in Act 3, really tugged at the heart strings whilst making one admire the artistry too. Amanda Forsythe was a brightly attractive, pert Amour, dressed in an amazing gold trouser suit. She brought a knowingness to a role often sung by a treble in the Vienna version. The production put Orphée in modern dress but was notably abstract and non specific, without trying to evoke setting of the original myth. In fact, I came to realise that the work really took place within Orphée's mind. 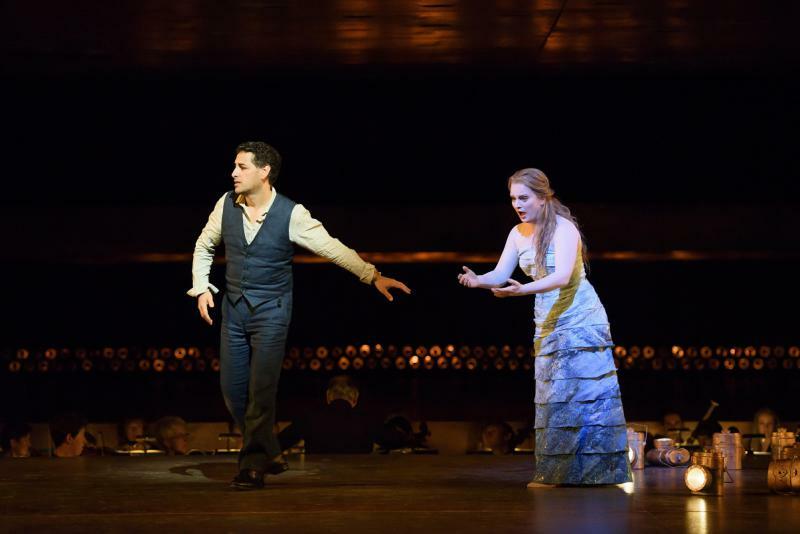 In fact, Fulljames and Shechter had based the whole on the modern concept of the fie stages of grief (used in counselling - Denial, Anger, Bargaining, Depression, Acceptance) so that the whole second act was Orphée's way of dealing with his grief leading to an acceptance where, after the long final dance sequence we saw Juan Diego Florez alone again. I have to confess that at first I found Hofesh Shechter's choreography a little separated from the drama, but gradually came to appreciate the expressive language being used and how the dancers meshed with the dramaturgy of the piece, and there was a lovely unity of style between the look of the staging, the drama and the dance. 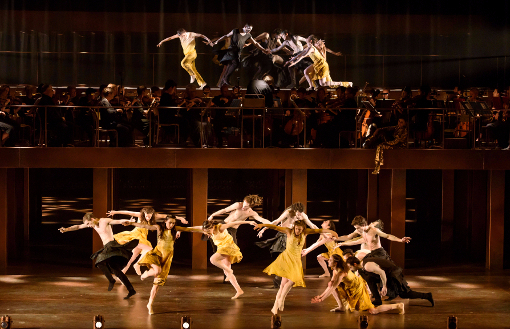 In fact, overall this was a very stylish production and one which we could happily see again. The Monteverdi Choir both mixed with the dancers and were separate from them, bringing strong but subtle tone to the music. John Eliot Gardiner and the English Baroque Soloists brought a sophisticated vigour to Gluck's music. Sophisticated simplicity true, but also a sense of strong emotions and a rich palate of colours. This was a very stylish and very striking production which had a series of interesting engagements between artists, work and style to create an absorbing account of a difficult to bring off masterwork. Update: I learned from a correspondent that the performances are being given at A-440 rather than at a lower baroque pitch, and I have amended the article accordingly.